To convert the vessel from one service sector to another, by an innovative design of a steel structure that covers the open hold of 103m x 21m to allow transport of project cargo using approx. 600tons of steel, that may be removed in the future for the vessel to return to its previous operational service sector with minimum re-work (i.e. leave all machinery operational and in place). 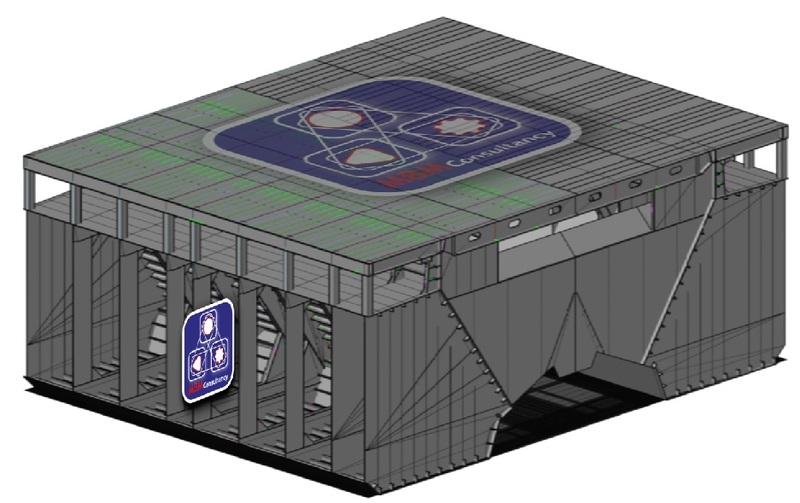 A high tensile steel closed project cargo deck, made of deep transversals and shallow longitudinals, without vertical supports. The new “Project Cargo Transport Deck Area” was increased at MBM suggestion to cover an area of 103m x 26m to include coverage over the port and stbd passageway. MBM made this suggestion after the first vessel survey whilst on the project as the vision is to assist the client with the optimum solution. This solution would provide an operational opportunity to increase the potential return of investment (+ROI) by utilising a RO-RO method from port/stbd loading with an SPMT option. The final “Project Deck” has a Class certified deck strength of 10tons/m^2. The new structure is in correlation with the existing vessel frame spacing of approx. 1500mm to harmonise and reduce structural stress and bending. MBM final solution has 5mx103m=515m^2 more deck area than requested for only an extra 100tons of steel, with the overall weight of approx. 700tons of steel not including paint, weld or additional lashing points. Longitudinal strength and local strength calculations. To make an enquiry for your vessel conversion, upcoming/ongoing Ballast water treatment system implementation, Fuel system conversion, vessel lengthening, Scrubber, Carousel Cable deck layout for OSV, Crane capacity upgrades, void tank conversions, bulbous bow fuel efficiency improvements, or any other conversion, please email: shipdesign@mbm-consultancy.com or tel. +49 (0) 491 960 464 05.